Weeks ago, I posted about the many reasons why I enjoy web browsing with Google Chrome. Today, I just added another reason to like Google Chrome. Malware protection. I don’t think Chrome is unique with this feature, as many modern web browsers offer some form of this functionality. Nonetheless, it is the first time I can recall ever being presented with such a warning. While I did not investigate the exact nature of this particular malware site, it does look to me like Chrome is checking all the content and links on a page. In this case, it found advertising which contained content from (or a link to) the malware site identified in the warning. Nice catch. Because advertising on the web today is often sourced from third party advertising networks, there’s no guarantee that an otherwise respectable web site will not inadvertently display such malware ads. This form of malware attack recently made its way onto the Star Tribune, just as it has to other popular and well-known web sites (e.g. New York Times). Having been using the Internet for almost 20 years, I’m pretty “street smart” about viruses, phishing, spyware, scareware, malware, and all the likes. And as such, I’ve been able to steer clear of these maladies. Nonetheless, this warning came as a surprise to me, because it was generated by a Top-5 link in the Google search engine results. Unfortunately, the Internet is still a kind of wild-wild-west, where criminals roam freely. These unscrupulous types are increasingly using ever-more sophisticated techniques to infect computers, which then give them access to credit card numbers, user passwords, and the means to launch distributed-denial-of-service (DDOS) attacks against web sites. Many times, a web browser is the vector of such infections. Thankfully, Google Chrome has been designed with an increased attention toward security. Gone are the days when visiting seedy web sites might get your computer infected. 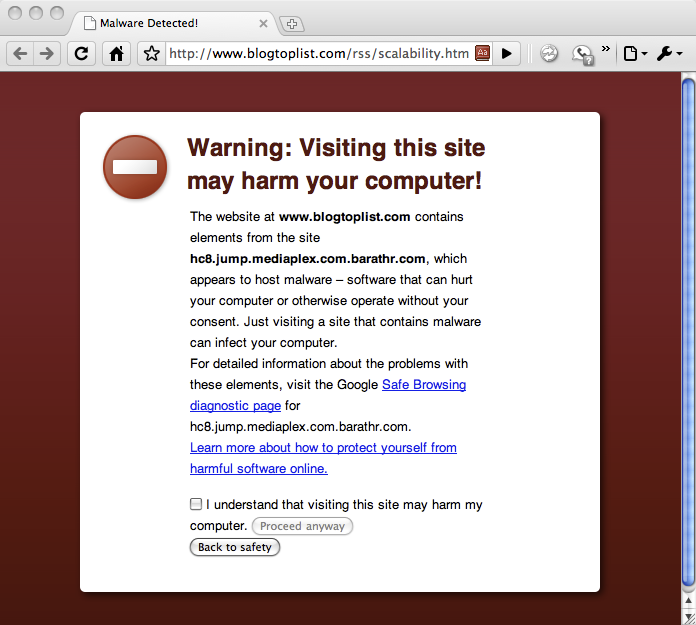 Today, you can be infected by the advertising displayed on a seemingly-safe and familiar website. This entry was posted in software by james. Bookmark the permalink.